This climb ends at the parking lot at the foot of the Tre Cime di Lavaredo. There, when visibility is good, you have a breathtaking view not only of the Tre Cime themselves but also of many other Dolomite massifs in all directions. Too bad that this is widely known. On a beautiful Sunday in summer, many thousands of tourists drive up here. The bike climb consists of two parts. The first part begins in Palùs San Marco, the last settlement in the Val d'Ansiei. After about three kilometers the road becomes steeper and the next more than four kilometers are fairly steep (mostly 8-10%). Here the road leads through the forest but occasionally there are views of the impressive mountains. After this steep section, recovery is possible while driving along Lake Misurina. Take a look back at the lake with the Sorapìs in the background. Lake and mountain are in almost perfect harmony! In 1956, during the Olympic Games of Cortina d'Ampezzo, the speed ​​skating events took place on this lake. Shortly after Misurina we turn right and the second part of the ascent starts. 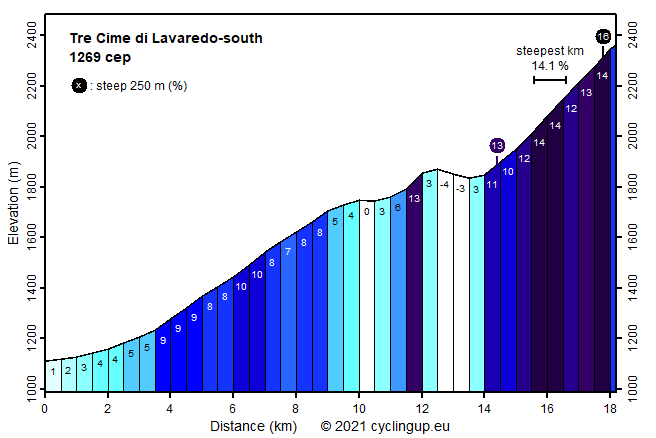 Soon a short (less than one kilometer), particularly steep (13%) ramp appears, a nice preparation on what's to come. After the ramp the road drops off (37 meters in altitude) and the tollgate for the cars is passed. The final four kilometers are extremely hard. The first of these is still reasonable (10-11%) but then the slope increases to 14% and this remains so almost to the end. I rode here on my hybrid bike instead of on my road bike because the hybrid bike has lighter gears. Other cyclists zigzagged up the street. At the beginning of the parking lot there is a bifurcation. Do not cycle to the right to the hut, but continue straight ahead and bend later to the right to reach the highest paved point. Enjoy the view!